Two Roman swords and a pair of 2,000-year-old wooden toys like those available in a museum gift shop have been discovered at a fort. The metal blades and wooden toy swords were unearthed during an excavation of a Roman cavalry barrack at Vindolanda on Hadrian's Wall. Archaeologist Dr Andrew Birley said the finds were like "winning the lottery". The items will all go on display in the site's museum in Northumberland in the autumn. 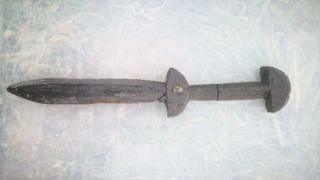 The first sword was found by volunteer Rupert Bainbridge in the corner of a living room of the barrack. It had a bent tip and a Vindolanda spokesman said it was the "ancient equivalent of a modern soldier abandoning a malfunctioning rifle". Mr Bainbridge said he was "excited" by finding "such an extraordinary artefact". A second sword, without a wooden handle, pommel or scabbard but with the blade and tang intact, was found in a neighbouring room. The weapon would have been valuable at the time, leading archaeologists to think its owner left the fort in a hurry. In another room were two small wooden toy swords which the spokesman said were "almost exactly the same as those that can be purchased by tourists visiting the Roman wall today". Other items found in the barracks' floor included bath clogs, leather shoes, knives, brooches, arrowheads and ballista bolts. Dr Birley said: "You can work as an archaeologist your entire life on Roman military sites and, even at Vindolanda, we never expect or imagine to see such a rare and special object as (the swords). "It felt like the team had won a form of an archaeological lottery." The finds are believed to date from about 120AD when the fort was thought to be home to about 1,000 people.